When your floor experiences heavy traffic and frequent activity, it can begin to deteriorate quickly. If you have pets, your flooring is at an even higher risk of showing signs of fast wear and tear! When you need pet friendly flooring for your Gonzales, LA home, you can depend on the flooring experts from our local store. We are familiar with a wide range of flooring, and are more than qualified to provide you with expert recommendations on the best performing flooring solutions. From innovative vinyl products, to stain resistant carpet, you will find the ideal pet-friendly flooring within our impressive selection. Do You Need New Resilient Flooring? 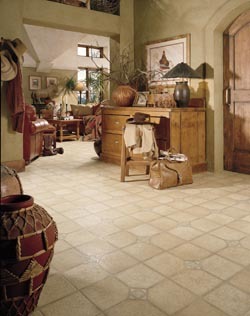 As the name suggests, resilient flooring is strong enough to withstand the most common types of damage. Whether you are worried about scratches from your cat’s claws, or spills caused by your dog’s wagging tail, we offer resilient vinyl products that are long-lasting and durable! What makes this flooring worth the investment is the fact that it resembles other coveted floor materials, such as hardwood and tile. While hardwood is a popular flooring choice, it often isn’t the best option for homes with a single pet, or multiple pets. With resilient vinyl floors, you can get the flooring you’ve always wanted with an improved performance and improved price tag! When you have pets, it’s not uncommon that you find yourself frequently cleaning up messes and debris. If this describes your day-to-day life then you need easy care flooring! Whether you want new floors that don’t absorb fluids or floors that resist deep scratches, our flooring associates will work closely with you to find a product that requires little maintenance and is easy to clean. This means you can spend less time worrying about your floors, and more time relaxing with friends, family and pets. In years past, carpet wasn’t a practical solution for families with pets. However, developments in carpet manufacturing make this popular flooring more durable than ever before! At our local store, you will find a selection of stain resistant carpet available in a number of hues, styles, textures and patterns. From simple and modern, to soft and luxurious, you are sure to find exactly what you’re looking within the exclusive line of products available from our business. Would you like to speak to a flooring associate about our pet friendly flooring? Simply contact us today and we will provide you with expert recommendations. We serve the communities of Gonzales, St Amant, Sorrento, Donaldsonville, Geismar, French Settlement, Maurepas, Pierre Part, and Napoleonville, Louisiana.